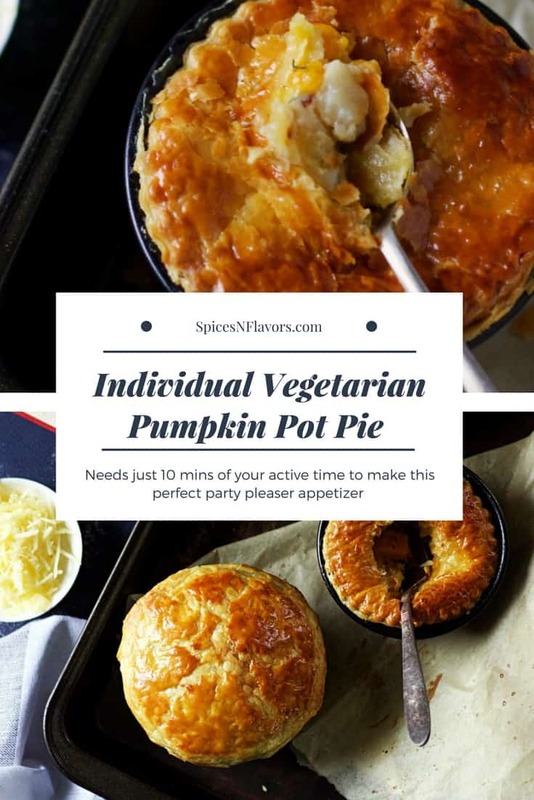 Vegetarian Pumpkin Pot Pie or to say vegetable pot pie in general is an individual portion of a regular pie that would be a perfect party pleaser. Vegetarian Pumpkin Pot Pies in the month of May? 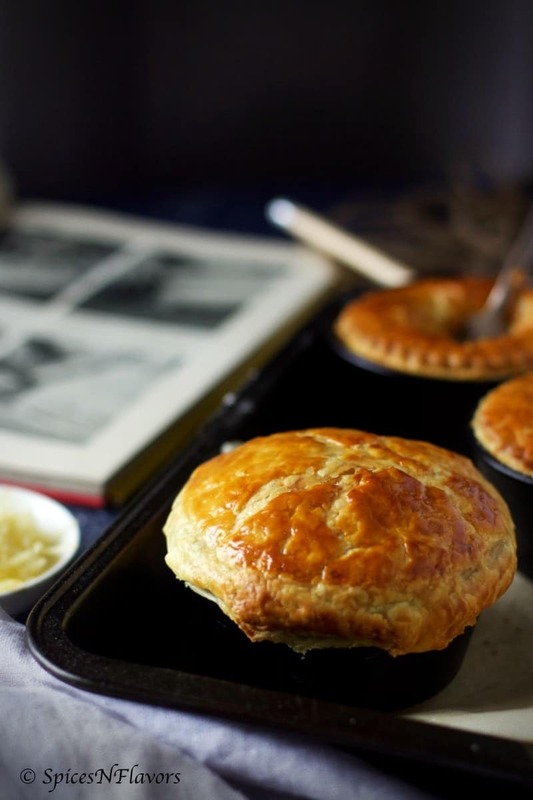 Well like I said in my earlier post too its winter in here and what better time to bake individual pot pie with puff pastry than this. Chilled weather, a pie, a book to read and some soda water (because I do not drink 😉 ) – a day well spent. 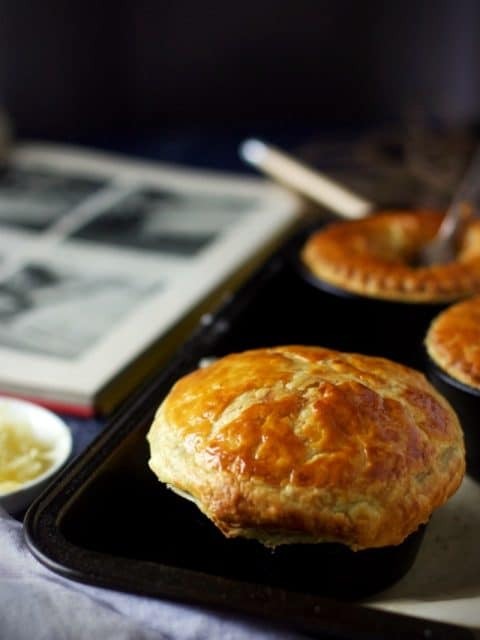 A pie is a baked dish which is usually made of a pastry dough, that covers or completely contains a filling of various sweet or savoury ingredients. 1. A pie is known for a soft bottom and a flaky puff pastry with beautiful laminations. 2. The pie must be flaky to touch and crispy to eat with soft filling. That gives a lot of different texture while we eat it. 3. The top of a pie must have a nice glaze and shine to it which makes it look appealing to the eyes. 4. Each pie must have a good amount of filling in it. 5. The filling must be juicy and moist with balanced flavours. How is this Vegetarian Pumpkin Pot Pie different from a regular pie? 1. 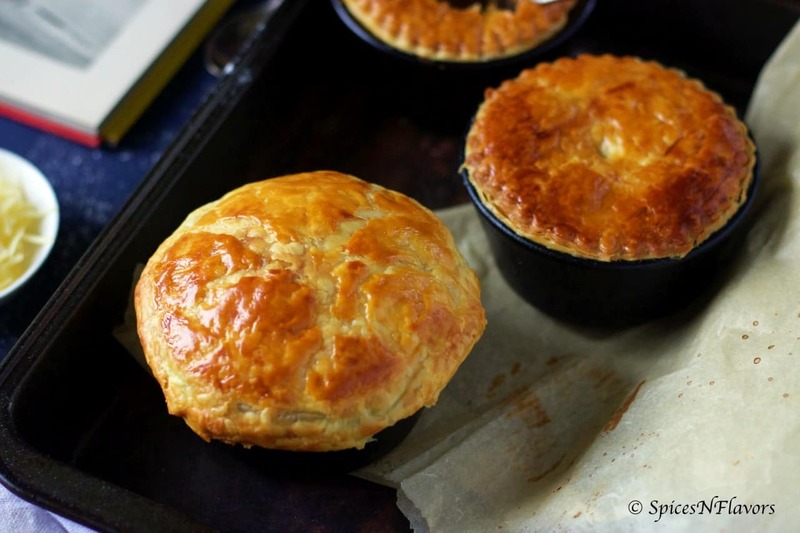 Baked in an individual pot pie bowls these are ideal if you are after portion control. 2. 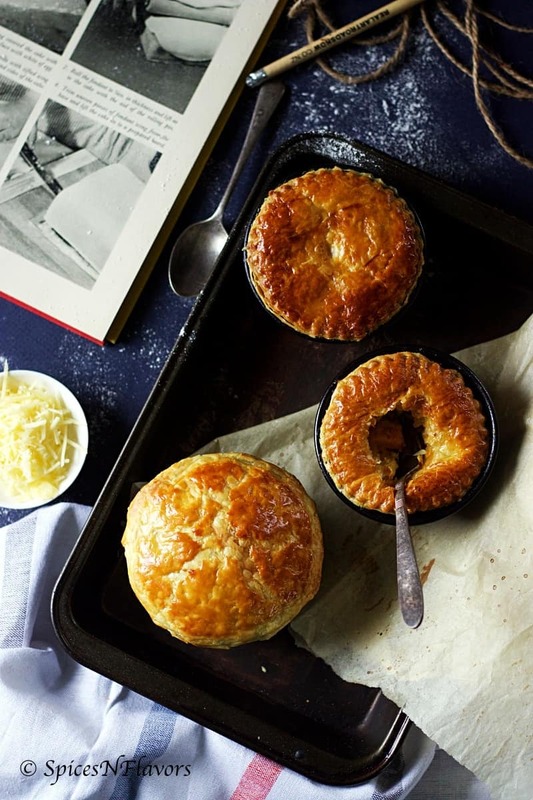 A perfect party pleaser; because you can bake them in individual pot pie baking dishes – I mean the use and throw aluminium foil ones; which means easy for serving as well as for enjoying. I am always game for recipes that say about fewer dishes to wash like this Vegetarian Pumpkin Pot Pie or One Bowl Chocolate Cake or Vanilla Cake. Wondering what other types of pies are the most famous in the local bakeries here in New Zealand? 1. Individual chicken pot pie, in fact, meat pies are the most famous or you might say a classical and authentic kiwi food it is. 3. A regular vegetarian pies. So What size ramekin for individual pot pies can be used? You can use any standard ramekins or individual pot pie dishes that you feel would be perfect for your party. 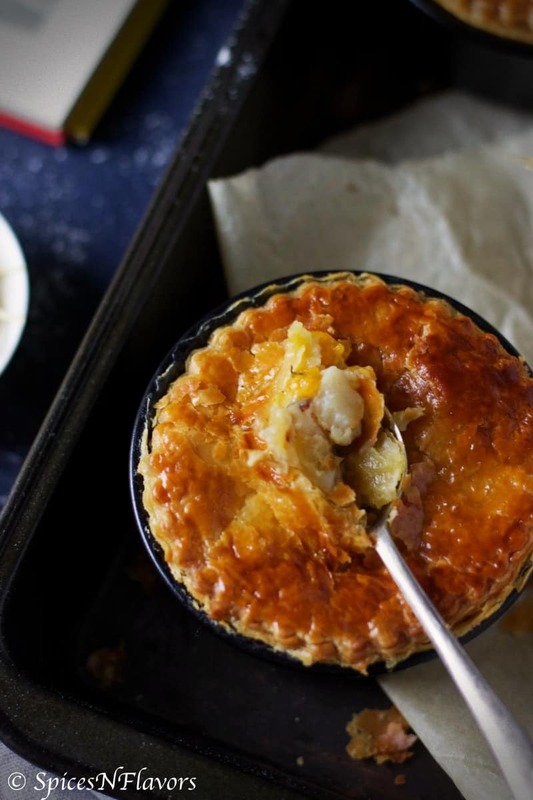 An individual pot pie with puff pastry is characterised by its flakiness and crispy texture. Ever wondered what gives the puff pastry that rise and flakiness. So we were discussing the puff pastry; the top of our Vegetarian Pumpkin Pot Pie. 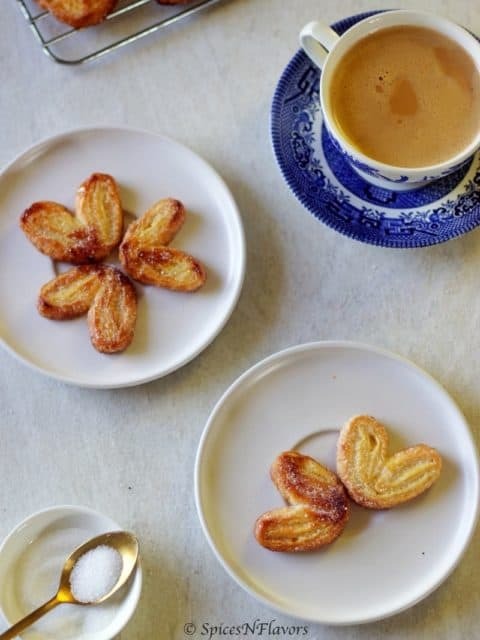 Even though I have used store-bought puff pastry here and made our job easier but I have learnt and made my own several times when we I was doing my Bakery Course here. 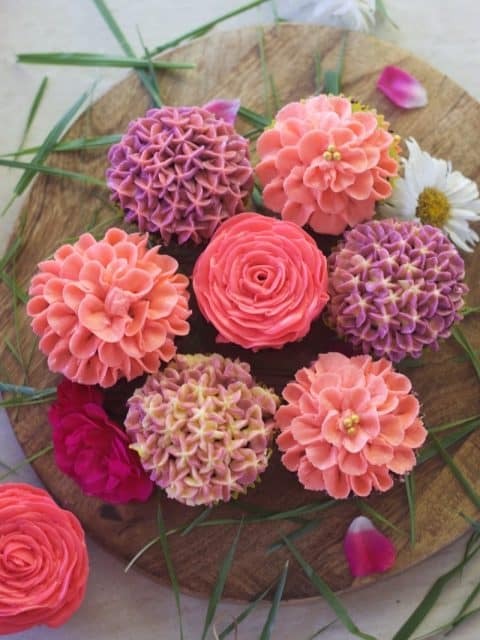 Every product that we bake has to have some kind of aeration which makes it rise and creates an end product that is palatable. This puff pastry falls under the Physical Aeration category. 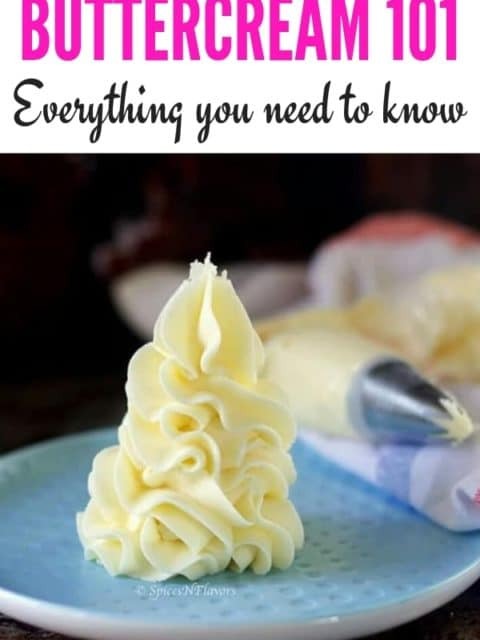 What it means is just like we use Baking Soda, Baking Powder as a means of Chemical aeration; Physical Aeration refers to the steam that causes the puff pastry to rise. Puff Pastry is a light, flaky and laminated pastry or dough that contains alternated layers of flour and butter in the solid form. Under the heat; the butter melts thereby creating a gap in between. This gap between the layers left by the fat melting is then pushed by the steam produced by the water in the dough. Example of this includes today’s vegetable pot pie or vegetarian pumpkin pot pie recipe. And piercing this puff pastry dough will prevent excessive puffing example of which is the Custard Slice. This correlates to the fact that better the quality of butter the better your puff pastry would be. Also, the amount of butter in the dough is also related to the flakiness of the pastry. Vegetarian Pumpkin Pot Pie is a perfect party appetizer or starter recipe that just needs 10 mins of your active time. Lay out the diced vegetables on a baking tray. Drizzle about 1-2 tbsp of oil, sprinkle some salt and garlic powder. Roast them in a preheated oven of 200°C for 15-18 mins approx. Meanwhile, start with your roux. Melt the butter in a saucepan, once melted add in the flour and cook for a minute or so until the starch gelatinises that is the flour cooks. Stirring continuously add the milk and allow the mixture to thicken and become a saucy consistency. Remove from the flame and stir in the roasted veggies, garlic powder, cheese, almonds. Mix it through do a taste test add salt and chilli flakes to taste. Spoon out the batter into ramekins of your choice upto the brim. Thaw the puff pastry sheets as per the instructions and the quarter them that is cut them into 4. Place one sheet over the top of ramekins press down slightly and trim off the excess. Egg wash the top for better shine and glaze. Make a slit in the centre for steam to escape and then bake in a preheated oven of 210°C for 20 mins until the puff pastry has puffed up and nice golden brown in colour. 1. Use pre-cut veggies that you get packaged from the supermarkets or you can also cut veggies the previous night before going to bed. 3. And then mixing everything or the seasoning takes just 2 mins. Layering the store-bought puff pastry take another 3-4 mins. Boom!! I guess that’s not even 10 mins of your actual time. Leave the rest to your mighty oven!! 1. Roasting the onions and mushroom takes lesser time as compared to the root vegetables. It took me 12 mins to roast the onions and mushrooms, 15 mins for the pumpkin and kumara, 18 mins for the potatoes. The timing may vary depending on the size of your cut veggies, and the type of veggie that you are using to make this individual pot pie recipe. 2. While roasting the veggies in the oven, always make it a point to stir them every 5-8 mins so that the veggies do not stick to the pan and burn eventually. 3. While making the sauce, do stir it continuously or it might turn lumpy. 4. One mistake that I made was – While cutting the puff pastry using a cookie cutter I pressed it too hard which cause the beautiful layers to squish and so it did not rise much in the oven. So I would recommend you guys to quarter the puff paste and use it on top of the ramekins while making this Vegetarian Pumpkin Pot Pie. 5. Ofcourse, in place of egg wash you can use milk instead for the same. But brushing the top of the puff pastry is important because that is what gives the individual pot pies a glossy and shiny look. 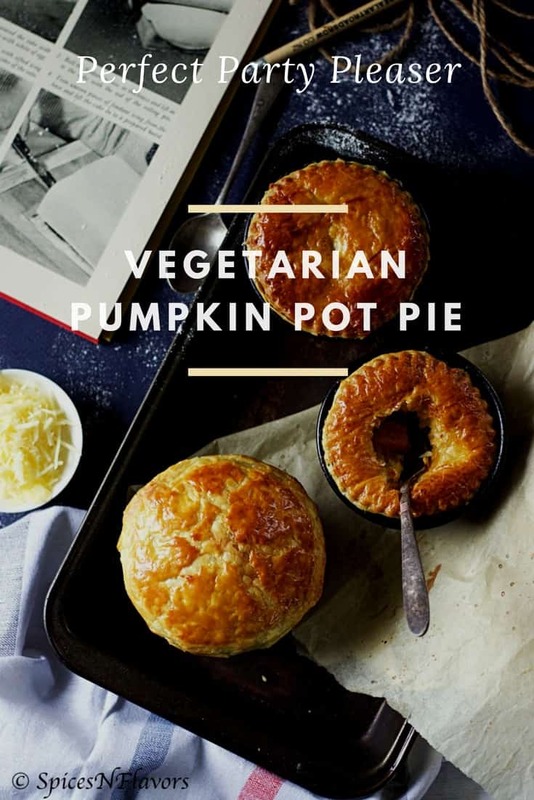 If you happen to try this amazing Vegetarian Pumpkin Pot Pie or if you like this recipe then do let me know by tagging me, tweeting me or instagram me. I would love to follow you and your posts.